Go along Via V Maggio as far as Villa Carrara (number 81). Garibaldi’s mission to conquer Sicily and unify Italy started from this rock hidden beneath the Aurelia road. The small statue is Genoa’s reserved and heartfelt homage to the hero of Italy’s unification. 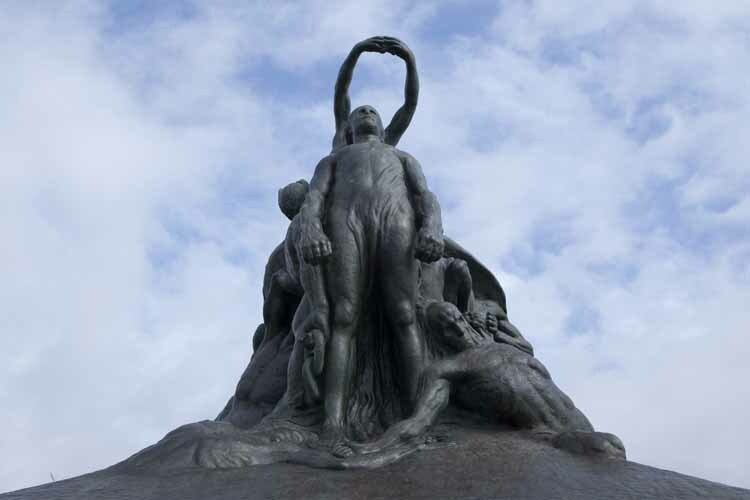 Obviously this does not have anything to do with the wealthy balconies of the Monument of Quarto which dominate the sea on the other side of the inlet. On the occasion of the anniversary of the Unification, in 2011, the balconies were turned into an unconvincing altar to the fatherland. Until that time it used to be a shabby corner of paradise with which Genoese people where madly in love. Every day, from April to September, hundreds of people gathered at sunset. Trend-setters wearing sunglasses stood alongside bongo drum players, among the smell of marijuana and salt. 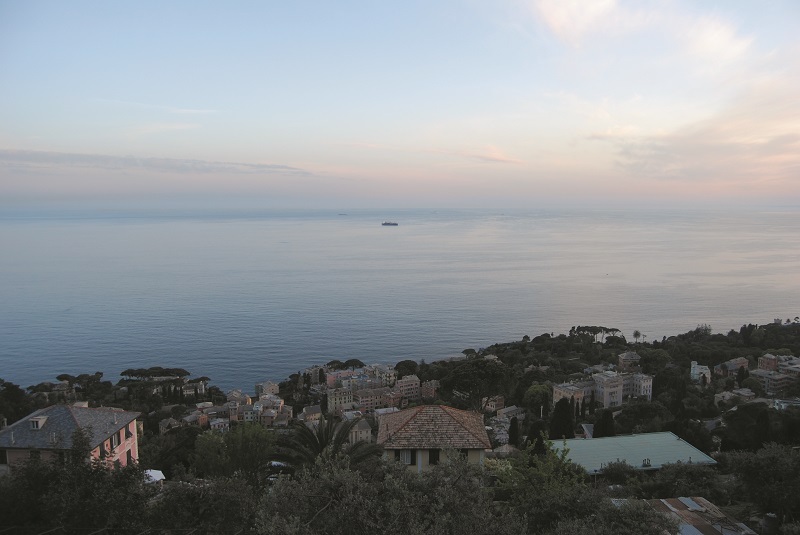 Despite the restyling the view is still enchanting… The gaze runs beyond the horizon, only to lie down on Capo di Santa Chiara and the Boccadasse bell tower. 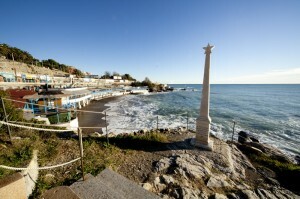 If you walk past Piazzale Crispi and the Monument, you can go along Via V Maggio, on the side next to the beach. The gurgle of water on the rocks scratches the ear. 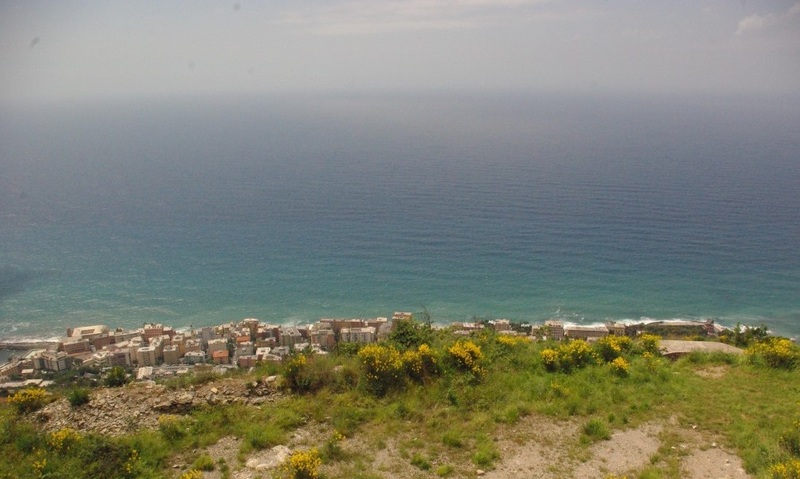 It pleasantly reminds us Genoese that everything that has to happen will happen anyway. Then, as soon as you take the first turn in Via V Maggio which introduces the view of the Priaruggia borough, the gurgle will calm down and you will hear the louder noise of traffic, the human issue par excellence. Go under the railway bridge in Viale des Geneys and climb up along the narrow Via Priaruggia, an ancient “creuza de ma” (a Genoese word more or less equivalent to “mule track to the sea”, translator’s note). Modern apartment blocks and smaller houses are mixed, age-old buildings invade the road, like Villa Stalder, today a kindergarten. 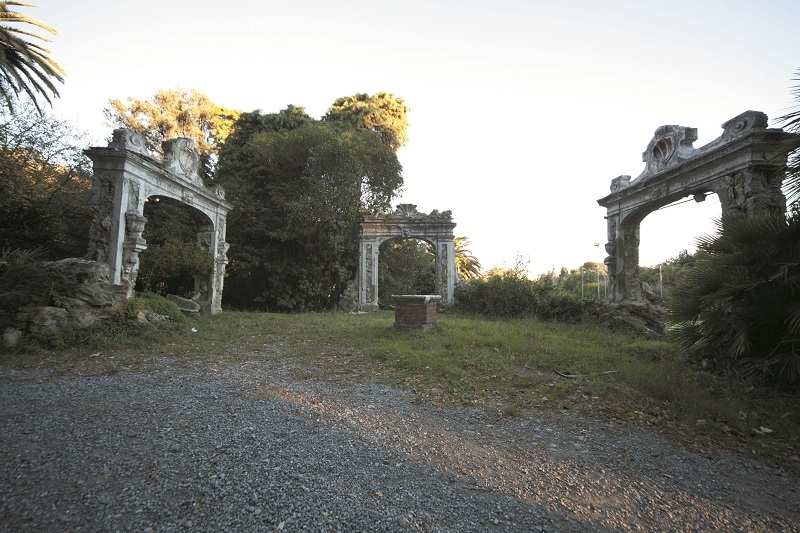 The public park next to the villa is hidden inside the concrete in the Quarto neighbourhood. It is an unexpected urban oasis. Go straight on along the creuza, cross Viale Pio VII and keep walking through Via Priaruggia along the huge walls of Villa Quartara. On your right, a small staircase allows you to enter the garden of the villa dating back to 1395. The air is soft and releases a delicate fragrance. The noise of the city is so far that you hardly believe that Corso Europa, one of the city’s main roads, is only a few metres’ away. You will observe the contrast between the shiny white marble and the green foliage, if you move the branches of the willow tree with one finger. You will also get a glimpse of the three ancient archs, like breadcrumbs of history drying out. They seem to whisper that resisting the passing of time is useless … You can note Horace’s words, still legible … “Oe tulit punctum/ qui miscuit/ utile dulci”: those who combined business with pleasure achieved perferction. If you go back to the walls and carry on walking along the perimeter of the villa, you will find Via Romana della Castagna and, only a few steps further, the S. Maria della Castagna church, built in Romanesque times. 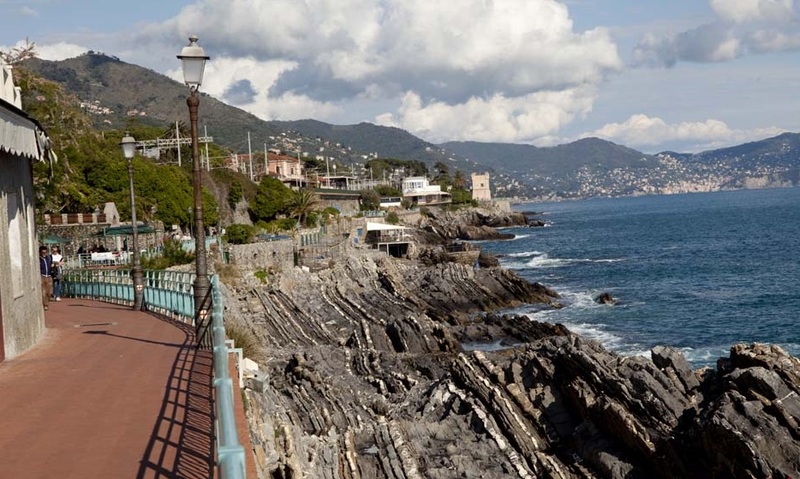 We are following the ancient Roman pathway, the eastern section that crossed Genoa and reached Rome. The fascinating washtubs on the river that flows towards the sea surrounded by thick vegetation, the rural buildings showing the blood of bricks are like the layers of rocks for speleologists, they all reveal details that time has forgotten to take away. The example par excellence is Villa Bianca which you will see on your left after going past the crossroads with Via Ottolengo. Carry on following the path which, once you get past the junction with the wealthy Via Fabrizi, turns into Via Antica Romana di Quinto as far as the parish of San Pietro. We were at the parish of San Pietro … Head towards Piazza Beata Paola Frassinetti, then Via Bolzano, then turn left along Quinto’s main road, i.e. 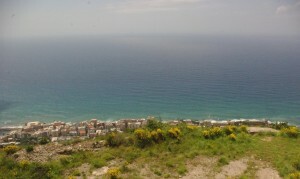 Via Gianelli. 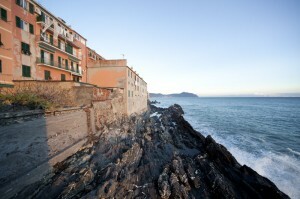 You will be walking along the seaside overhanging one of Genoa’s busiest beaches. From now on, morph into a round stone and roll. 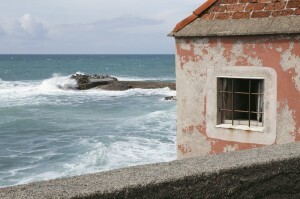 Even unsteady steps will take you to the seaside. Always remember to look up, before abandoning yourself to the creuze of which you cannot see the end … The horizon will be hanging among the buildings like a washing line for clothes that have been hanging out for God knows how long. Or if you want to cheat, shelter behind 3, Via Gianelli, where poets hide before disappearing where salt erases colours and strips the plaster off … And if there is something in your head that you did not want to think about, think about it. You will have the impression of seeing only the body of the man with the temples exposed to the wind, as his mind will be inside the briefcase. You will appreciate the effort of the guy who goes jogging, whilst the tourist flicking through the postcards will not draw your attention. Two young lovers are sat on the light blue bench. If you imagine them sat on a cloud, their expression would not be any different and the desire to love would be the same. 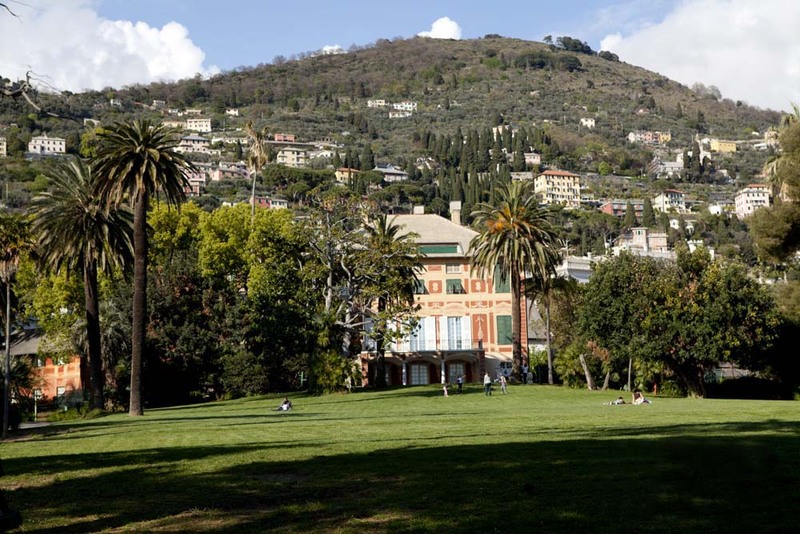 As you walk past the junction with Via Serra Gropallo, go along the ancient walls (today their purpose is only that of hiding the railway) of the villas, with tall maritime pines and cypresses dominating the promenade, witnessing a promise which will be hanging forever. If you are curious enough, you will find sculpted marble behind the walls, and rusty grids dividing the gaze from the sea, an enchantment not suitable for a postcard, but worthy of Baudelaire’s drunkest sonnet. The villas beyond the railway used to be owned by the noble families of Genoa. Today they cover a park of 92,000 m². 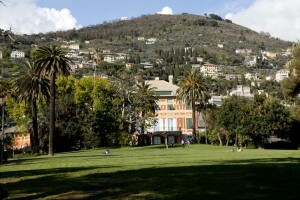 The entrance to Villa Grimaldi leads to the Nervi parks, before coming to Capolungo. 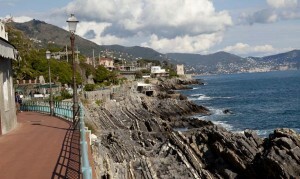 Portofino and Camogli’s ‘heaped houses’ invade the sight beyond the blue railing. From the small Capolungo beach, where Passeggiata Anita Garibaldi ends, the old creuza (Via Romero in the first section) climbs up to reach the Sant’Ilario village on foot, Genoa’s last neighbourhood before the border with Bogliasco. Do not be afraid, the walk will not be a piece of cake, but it will not take long (roughly 20 minutes). As you walk past the old station (the one mentioned by De André in ‘Bocca di Rosa’…) and cross the Aurelia, the creuza takes the name Via Inferiore alla Chiesa di Sant’Ilario, then Scalinata alla Chiesa di Sant’Ilario, amongst the luxury homes and ancient buildings (the small religious building at the start of the steps is enchanting) as far as the mediaeval church, the façade of which was restored in the 20th century. The creuze stretch as far as the rural enchantment of Sant’Ilario’s old buildings. Climb up along Via dei Tasso, behind the church. Just like a lion’s jaws, the distances that the eyesight cannot measure open up … Then plummet down, just like an arrow shot by an archer, when you do not need to take aim. The effort of going uphill is rewarded by the sound of your steps hitting the stones. There is no other noise but wind, rain and water. Up there you have not escaped from life. Rather, you have tried to grasp it in an attempt to resemble it. And what is left of the planet is the iron against iron of the trains at the bottom of the valley or a plane’s roar. What is left remains at a distance. What can I find in this area?